Reward your B2C & B2B customers for their purchases and other actions. Calculate sales commissions in-real time based on your CRM data. Start your own MLM business within 10 minutes! Reward you customers & partners or successful referrals. Import user database from your CRM, e-Commerce platform or other tools you are using to store users data by simply exporting CSV file and importing it to Ignico. Start sending users data in real-time by connecting your tools to Ignico via API or enable built-in on-line sign-up form. Connect Transaction Data Sources & Start Rewarding Your Team/Community! Connect external data sources (CRM, e-Commerce, Marketing Automation Tools, Blockchain) via API or transport data periodically via CSV import. Your sales team or community of brand ambassadors starts to get rewarded immediately! Increase sales by real-time incentives for team performance. Easy setup, robust results. We have a special pricing for cooperation with marketing agencies. What are the ACTIONS that I pay for? An action is every activity of your user for which you decide to reward him. It could be ie. : Order, Signup, Download, Booking, Closed Deal etc. (there are multiple action types in Ignico). Actions may have parameters such as value or points. Ignico supports also custom action types you can create yourself to tailor them to your business. How can I start using Ignico? You need to set up your account & start 14-day free trial to see if it fits you. Then you can fill in your billing data and start using Ignico based on monthly payment. Where can I get some technical help on integrating my e-commerce/CRM with Ignico? The best way to get some help from our developers is to join Ignico Community on Slack. Please also have a look at the documentation to Ignico API. Another way is to use live chat once logged-in (it helps us to identify you as Ignico user). How can I connect Ignico with my e-Commerce/CRM? Do I need to leave you with my credit card while setting up the trial? No, we are not requiring credit card details upon trial signups. You can use Ignico or 14 days completely for free without any credit card pre-authorization. How can I access more bonuses & rewarding rules? 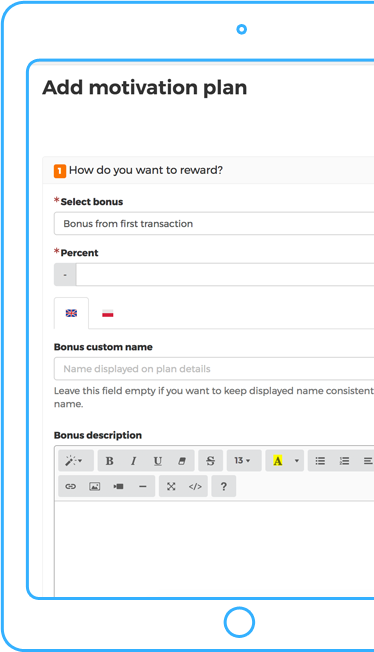 We are still developing new rewarding rules to the configurator and will keep you posted about them. If you have any particular request, please contact us at contact@igni.co or use chat icon on the right-bottom corner.